If you are thinking that after the successful completion of iconic projects like Burj Al Arab, Burj Khalifa, Palm Jumeirah and many others as described in a recent article published in this blog, Dubai does not have anything else to offer, you are wrong. Dramatically wrong. Irremediably wrong. Even though the world crisis had some kind of effects in the local economy, with people leaving the Country and some companies slashing investments because of the finance crack, Dubai and the Emirates managed to successfully overcome the impasse and elaborate a successful way out of the crisis. Even the current low oil price situation that stresses the financial status of many oil producers and exporters in the region, has no effect to the iconic projects currently undergoing in the Emirates and that are due to sensibly change Dubai projecting the most dynamic city in the world directly in the future. What do we have to expect next? Have a look at some of the greatest projects under construction. The Dubai Eye is going to be the biggest ferry wheel in the world and will allow visitors to have an impressive view of the major landmarks in Dubai: Marina, Palm Jumeirah, Burj Al Arab and the silhouette of Burj Khalifa. 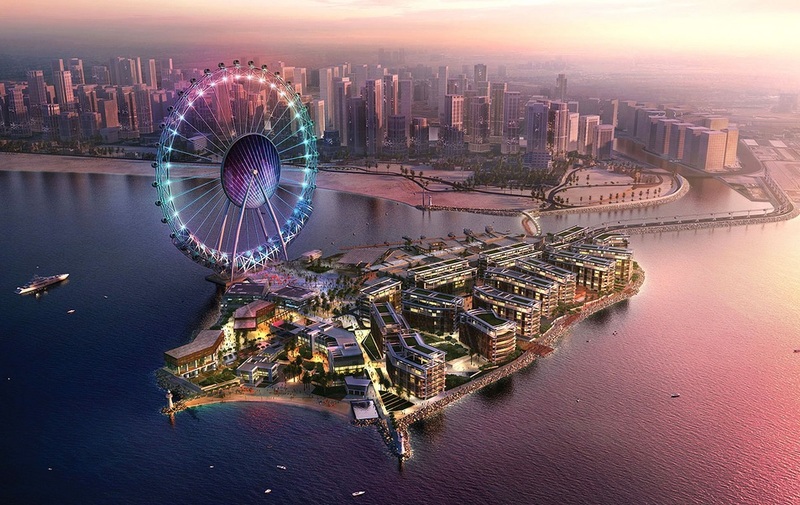 The wheel, however, is not the only attraction to be built in the artificial island called “Bluewaters” currently under development by Meraas Holding in front of JBR. The new neighborhood will feature indeed a bespoke: “‘souq’ encircled by a promenade that will boast alfresco dining outlets serving a wide variety of cuisine. The ‘souq’ will also host an eclectic mix of retail stores and a ‘food hall’ offering fresh produce in a traditional ‘market’ atmosphere” as affirmed by Abdullah Al Habbai, Chairman of Meraas Holding. Have you ever dreamed to visit the Tour Eiffel in Paris, the leaning tower of Pisa, the Taj Mahal and the Pyramids in Egypt in one go? It will probably cost a fortune in air tickets and a long holiday. Now it is going to be very easy. Falcon City of Wonders is the new neighborhood in Dubai where you can find many of the wonders of the ancient and modern world. Other than the four already mentioned, the city under construction will host the Hanging Gardens of Babilonia and the Great Wall of China!!! And everything will be included in a perfectly livable city build in a falcon shape. Incredible. The Falcon shaped city is currently under development and is located here. 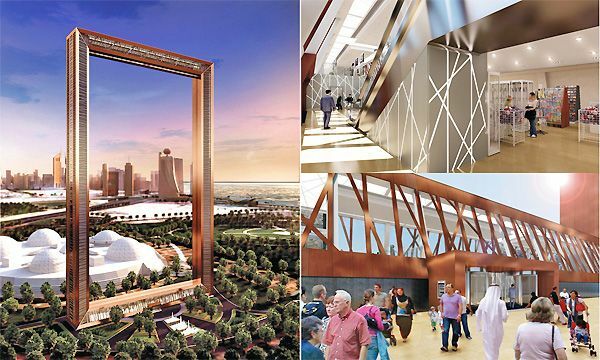 As its name suggests, Dubai Frame resemble a giant picture frame and will frame views of the city, allowing a scene of Old Dubai from one side and the New Dubai skyline from another. The giant rectangle will host also a view gallery on the top of the structure, the “sky bridge” that will span from one side of the frame to the other. The works are currently ongoing and the Project is due to be completed in few months as recently reported by GulfNews. Conveniently located in Zabeel Park, The Frame will offer an amazing framed view of Burj Khalifa and Dubai Downtown. This Project has been inspired by H.H. Sheik Mohammed bin Rashid Al Maktoum, ruler of Dubai. In a recent interview reported on The National, he stated that “The goal is to develop scientific and innovative solutions to address the developmental challenges of cities of the future, and contribute to stimulating innovation“. 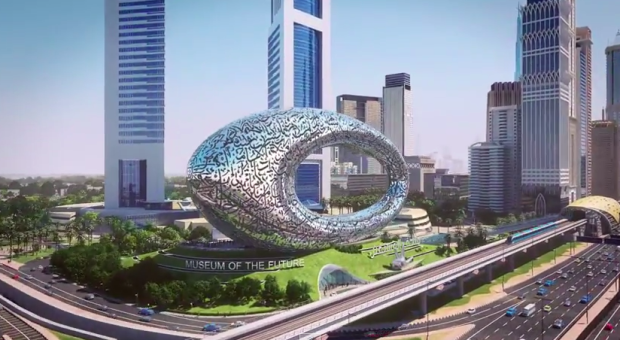 Since the project aim is to project Dubai in the future, the building that will be hosting the museum couldn’t be a simple building but something special. Indeed it will have a futuristic shape and there will be arabic writing engraved on the external walls. Dubai was founded on the benches of a natural creek that offered a safe harbor and an important source of food and commerce (because of pearl hunting). The creek has been the heart of Dubai since the very foundation of the city and has been developed since then in order to boost the local economy. Recently the Government decided to extend the creek but not further inland. Instead they have planned to extend it until Business Bay and then to join its end with sea again in Jumeirah. The Project is simply impressive and requires an intensive relocation of infrastructures and houses. – Photo from GulfNews. The extension will be an important stimulus for local developers to build new hotels, restaurants, promenade and housing options that will further boost the economy of the city and change the aspect of many neighborhoods touched by extension. This entry was posted in Al Safa, Business Bay, Downtown Dubai, Dubai, Mega Projects and tagged Business Bay, creek, Downtown Dubai, dubai, Dubai Eye, Falcon City of Wonders, GulfNews, Iconic Project, Jumeirah, Mega Projects, Safa Park, The Frame on September 10, 2015 by andreadetto. Scrumptious cakes at Clinton Street . . . superb! One of the best way to start the weekend in Dubai is to have a scrumptious breakfast somewhere around, possibly in a new restaurant or neighborhood. 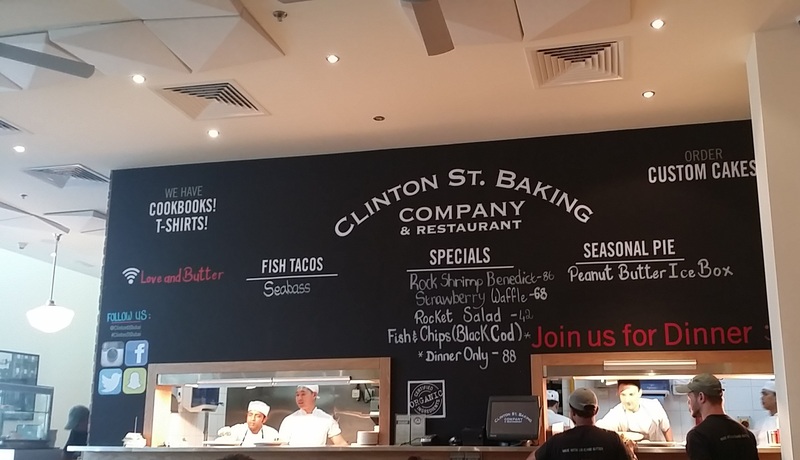 The last weekend a friend warmly recommended Clinton Street Baking Company and Restaurant in Downtown Dubai and since we haven’t been there yet, we decided to give it a try. The restaurant is at the Burj View Towers, a building complex were a friend of mine used to live and that offers a stunning view of Burj Khalifa and Downtown. The place however is somehow anonymous since it is in a corner and not really visible from the main road. Inside it is much better: a cozy place packed with people enjoying their meals and time together. At 11 a.m. when we arrived, there was only one table available, just to have an idea of how busy it was. The restaurant is simply arranged but very functional. The kitchen and chefs can be seen from the tables. Since we were there for breakfast, we ordered some eggs. 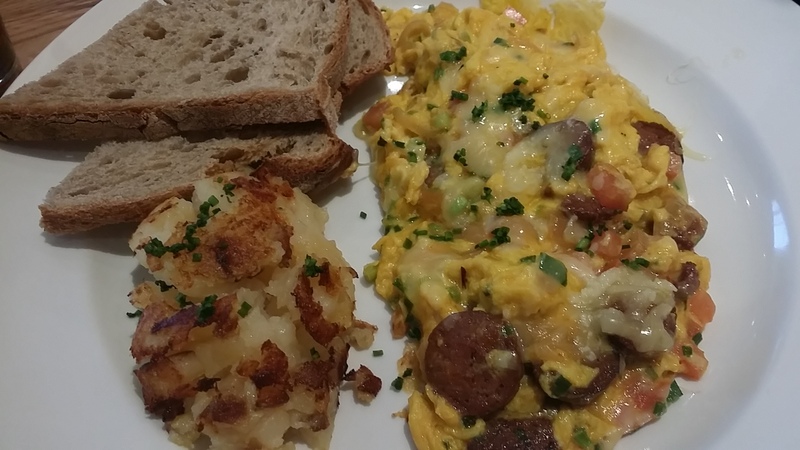 I have got the Farmer’s Plate and my partner a beef chorizo omelette also called Spanish Scramble. I was expecting something wow since my partner’s colleague was enthusiastic of the place and instead we received two very regular plates with little to be enthusiastic for. We were a bit disappointed, especially considering the 75 AED paid for the Farmer’s Plate and the 66 AED for the Spanish Scramble. The bottomless coffee, moreover, that comes endlessly for just 20 AED, wasn’t really satisfying my Italian taste. We were still hungry but didn’t want to order anything else from the eggs menu to avoid any further disappointment. My partner decided, together with a friend of ours, to switch to the desserts: the best idea ever. The desserts are scrumptious! 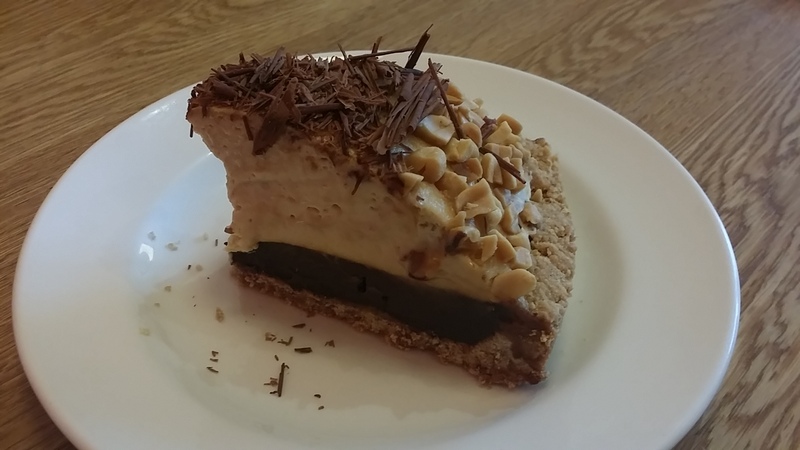 We had a peanut and chocolate cake that was literally mouth-watering in the aspect and superb in the taste. The peanut and chocolate cake at Clinton Street is superb! We shared this slice of cake and couldn’t resist to order another one. 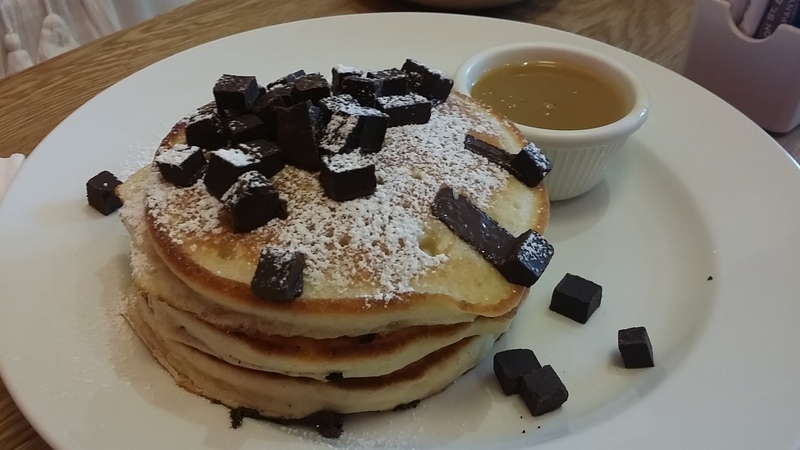 This time we chose a simple pancake that actually consisted in a tower of three pancakes, fluffy and delicious pancakes, with melting chocolate cubes on top. Once the chocolate melts completely, the pancake is something irresistible!! Mind that the pancakes are a big portion and can easily substitute your meal in case you are not a big eater. The maple syrup on the side was the perfect match with the dark melted chocolate. So yummy, but pay attention . . .I had way too many sugars because of the exquisite taste of the cakes and had to force myself to stop eating other baked sugary stuff!!! The bakery side of the restaurant is definitely recommended!! 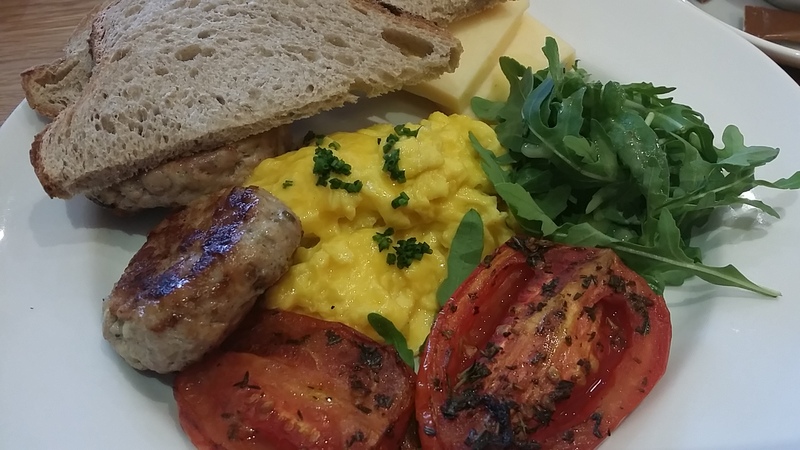 This entry was posted in Breakfast, Downtown Dubai, Dubai, Restaurant in Dubai and tagged Breakfast, Cakes, Clinton Street Bakery Company, Downtown Dubai, dubai, Eggs, Food, food lovers, Foodaholic, Restaurant, Restaurant Review on August 27, 2015 by andreadetto. Downtown Dubai : the centre of now! We have recently enjoyed a buffet breakfast at The Pavilion café in Downtown Dubai. Next to it there is the Emaar Pavilion where the well known construction company showcases its successes and the future developments currently in progress or just designed. 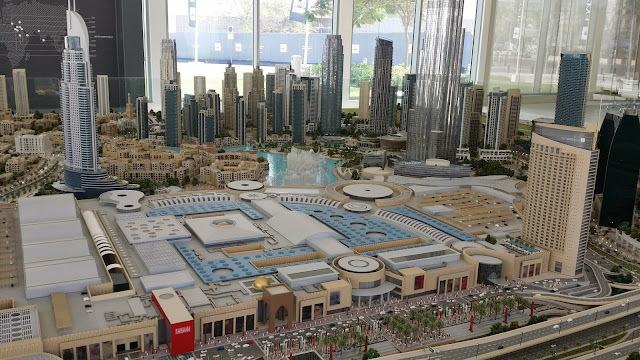 The breakfast was really nice, however, what really got my attention was the Downtown scale model present in the main exhibition hall, a representation of the future Downtown Dubai. For those who do not live in Dubai or still have to visit this amazing city, it is worth mentioning that Downtown Dubai is slightly becoming the real city centre and definitely is recognized as one of the top landmarks in town. The major attraction is definitely Burj Khalifa, the tallest free-standing building in the world that with its almost 830 meters is very impressive and scenic as already described in a previous post. Burj Khalifa is accessible to visitors and non residents for dinner (there are few restaurants available) and for a nice photo shooting from the floor number 124 wherein Dubai looks completely different (Observation Deck Website for more information). 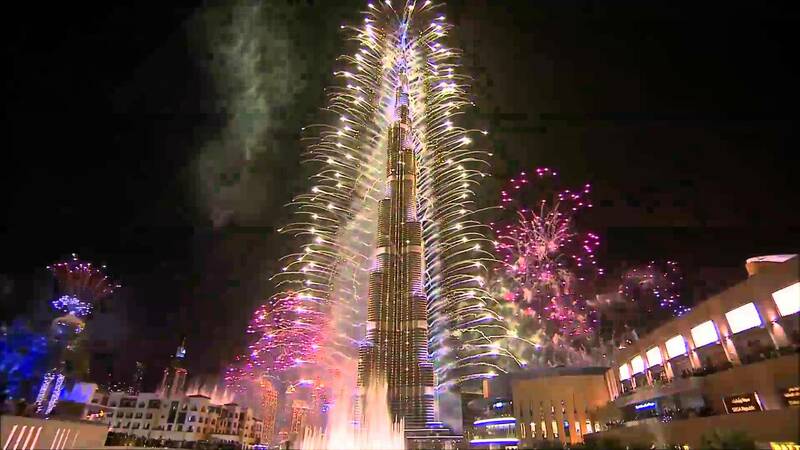 Burj Khalifa is also the perfect location for NYE Celebration, since its 830 meters are usually covered by fireworks and laser games for an unforgettable party. The last time I celebrated NYE in Downtown, I recorded the amazing Fireworks Show. We have two other attractions close to Burj Khalifa, The Dubai Mall and its 1,000 plus shops and the Dubai Fountain where spectacular water and light shows are displayed during the day and specially during the night. I have recorded some videos if you like to see what’s the fountain show like. Useless to say that after completion of the works of the Burj Khalifa and its subsequent inauguration, the Dubai Mall and the linked Souq Al Bahar got an impressive boost in the number of visitors, making the landmark “self-sustaining”. A visitor can find great shopping opportunities in the mall, enjoy a lunch/dinner in one of the numerous restaurants available on the promenade facing the Fountain and Burj Khalifa and then enjoy the free shows offered by the fountain. If it gets bored, few steps away there is the main entrance to visit the Burj Khalifa observation desk, but in this case you need to book in advance. There are still some potion of land undeveloped, but this situation is not going to last long. 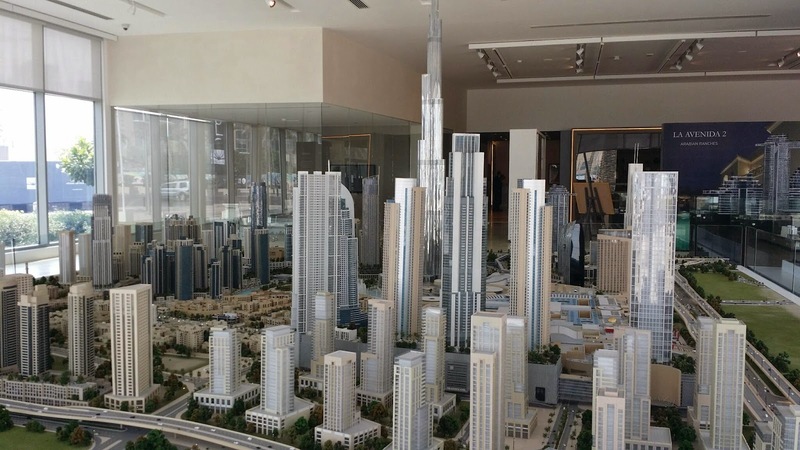 The good returns assured by Burj Khalifa and Dubai Mall in terms of visitors and raise in the adjacent apartment value, has pushed Emaar to further develop the area. A new Opera House, brand new residential buildings and utilities (like a circular tram) are indeed under construction. 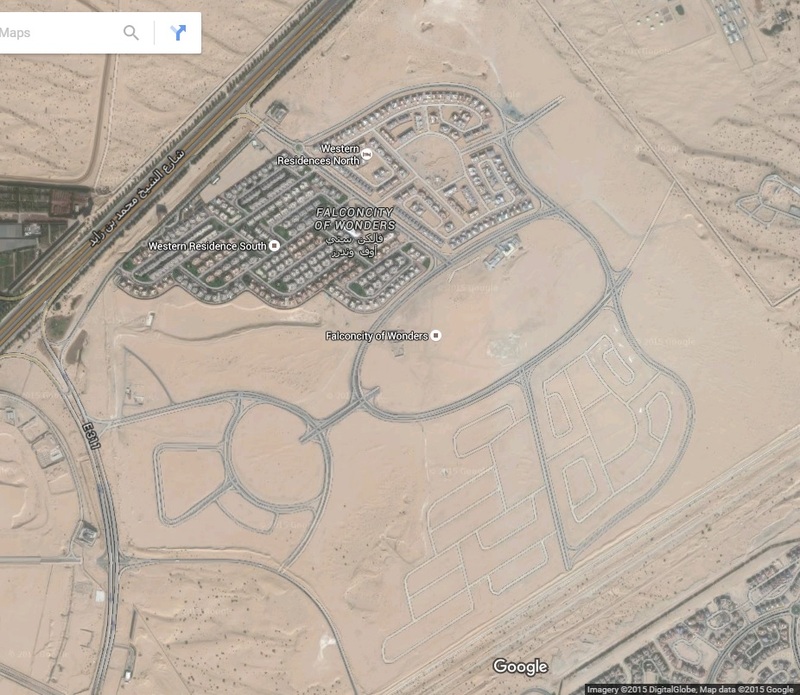 This is Dubai with its dynamic development that is constantly mutating the landscape. Thankfully the in scale model helped me in understanding what to expect in the near future. This entry was posted in Downtown Dubai, Dubai and tagged Burj Khalifa, Downtown Dubai, dubai, Dubai Mall, Emaar on June 24, 2015 by andreadetto. Dubai Mega Projects: the Origins and what has already been built! When first was inhabited some 5000 years ago, this piece of Arabian Peninsula could have looked a bit different than today. At that time there wasn’t the might of technology to ease the life in this arid land and people had to struggle to survive. However, some very well adapted nomad tribes found some suitable spots where to settle and prosper, such as oasis or coves. Among those areas, we could have found a little village destined to become the 4th most popular tourist destination (as of end of May 2015) with the busiest airport in the world (as of end of April 2015): Dubai. The first organized settlement was firstly recorded in the late 18th Century when Dubai was a fishing and pearl center of some importance. 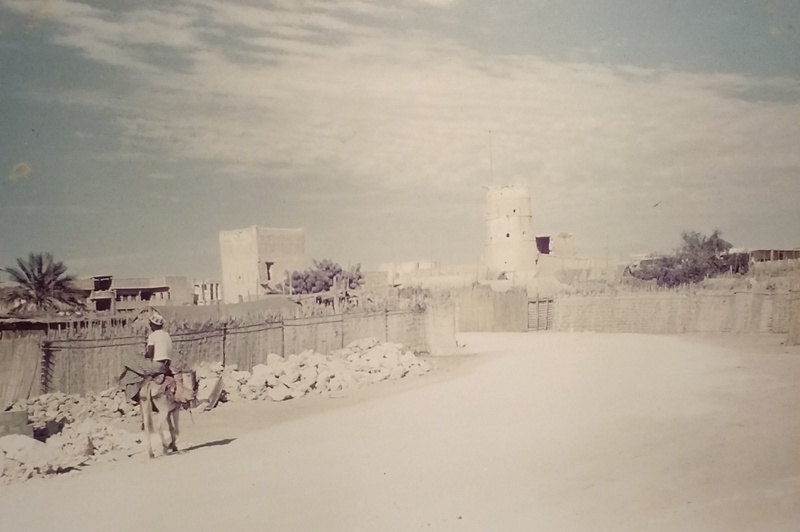 The population was trading these goods with good results and breeding goats and sheep other than cultivating date palms. The situation remained almost the same for many years, until the Great Depression struck and the Japanese invented the artificial pearls. This two factors mined Dubai sustainability and forced the at the time leader, to shift the economy from pearl producer/exporter to an import/export hub. The city developed closed to the natural creek, which represented a natural harbor where goods arriving from Iran, Pakistan, India and many other countries where stored and re-exported. At that point the mentality of the people changed and became more and more business oriented. When oil was discovered and the various Emirates scattered in the peninsula united under the United Arab Emirates state in the 1972, the leading families used the wealth to develop the country with infrastructures and modern technology. The clear vision of the Al Maktoum family (the ruling family in Dubai) together with the patronage of the Al Nahyan family (ruler of Abu Dhabi and the UAE), contributed to develop an ultra-modern city that is now recognized as one of best cities where to live. Most of Dubai success is due to the construction of iconic Projects that made the city worldwide famous. Here is a list of the most important ones. Dubai has already a great variety of mega Projects completed that became iconic landmarks famous all over the world. The most known is definitely the Burj Al Arab (the tower of Arabs), a 7 stars hotel located in an independent artificial island few hundred meters from the beach side. Its spectacular shape, like a sail, make it a unique piece of modern engineering and architecture. The interior is luxurious and you should be ready to spend up to a ‘fortune’ for a mesmerizing dinner in one of the several restaurants available. The hotel was built in the late ‘90s and inaugurated in 1999 in what was a fast developing city. The architect that designed the hotel and followed the construction phase, once told to Mega Structure (a National Geographic show) that the interior of the hotel was meant to be white and easy. However, the Sheik did not like the “boring” interior and instructed the architect to change it in a more colorful and captivating way. I guess the Sheik has been proved right so far. Another well know Mega Project already completed is Palm Jumeirah. It is an artificial island in the shape of a Palm and it is visible from space. You just need to open Google Maps to see it. The Palm is almost completed with some hotel projects viewing final completion approaching fast. Among others, Atlantis the Palm hotel is surely one of the best attractions to be visited and enjoyed during a visit, either for business or leisure. 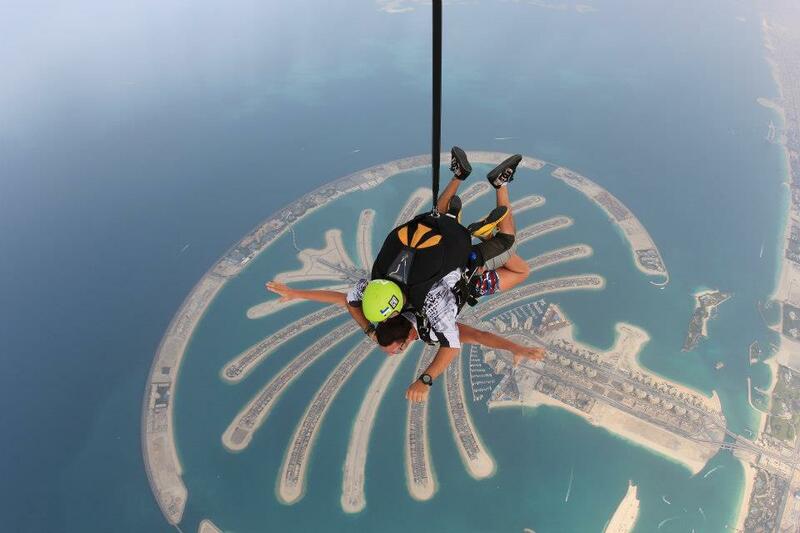 Many events are organized in Palm Jumeirah like concerts, parties (Sandance, Full Moon and others) and fireworks shows.Another activity that sees Palm Jumeirah as a protagonist is Skydiving over the Palm. An unique experience that has been so far, the most exciting in my life. You can read about it in my dedicated post here. Palm Jumeirah is the smallest of the three palms that were originally scheduled. Palm Deira, the biggest, still has to be started, while Palm Jebel Ali is under completion and should be ready before the important EXPO2020 celebrations. Palm Jumeira from the sky during my SkyDiving session. Amazing. I cannot avoid mentioning the Burj Khalifa, the tallest free standing building in the world with its 828 meters. When I moved to Dubai in 2009, the tower was under completion and the adjacent Dubai Mall was recently inaugurated. It was January 2010 when the tallest skyscraper in the world was inaugurated with an impressive fireworks show I am going to describe soon in a dedicated post. Since its opening, the combination of Burj Khalifa, Dubai Mall and Fountain shows, attracted more an more people from all over the world. 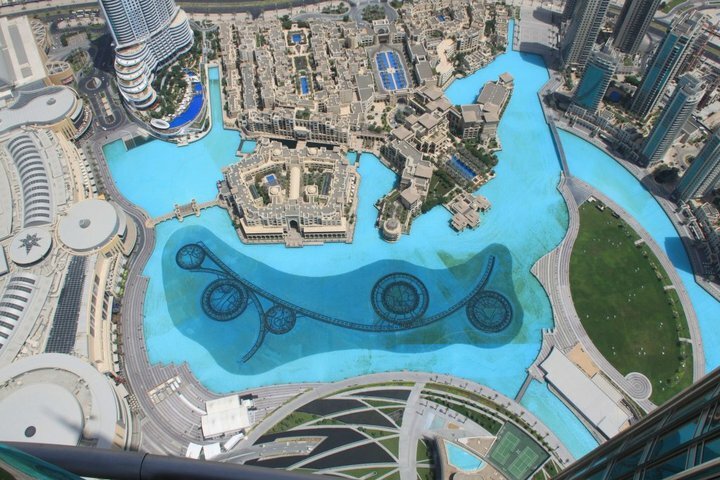 At The Top – Burj Khalifa – The fountains, Souq Al Bahar (up), Dubai Mall (left), Address Hotel (upper left corner). To be honest, the idea was not so original, since it was copied from the Petronas Tower layout in Kuala Lumpur (Malaysia), but definitely it was planned to be bigger, taller, more impressive. The result is astonishing and really deserve a visit. The Dubai Mall has something like 1,100 shops and restaurants and is estimated it gives jobs to something like 7,000 people. Hence, the Dubai Mall alone is as populated as my own town in Italy!!! If you like, there is the possibility to access the observation deck and have a panoramic view of Dubai from above 300 m height. The observation deck is called At The Top and it is highly recommended to book your visit in advance for two reasons: a) you will pay less; b) you would be able to chose the timing you prefer. And many other astonishing Mega Projects are under construction. 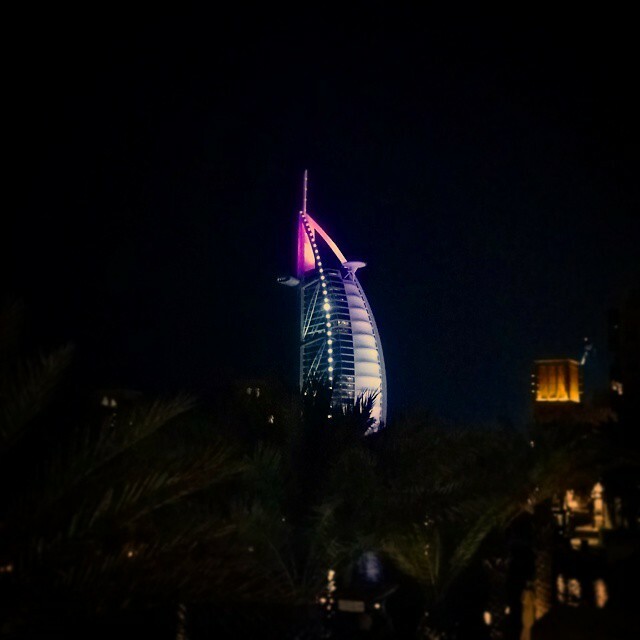 This entry was posted in Downtown Dubai, Dubai, Exploring, Skyscrapers and tagged Burj Al Arab, Burj Khalifa, Downtown Dubai, dubai, Dubai Mall, explore, holiday, middle east, Palm Jumeirah, Souq Al Bahar, travel on June 13, 2015 by andreadetto. I believe normal that when we hear news about the Middle East we all think about desert, sandy places, palms and dates, camels and recently oil. Well it is quite true, but we should not forget that here and there, there are also amazing oasis that give to the sandy landscape a different tone. 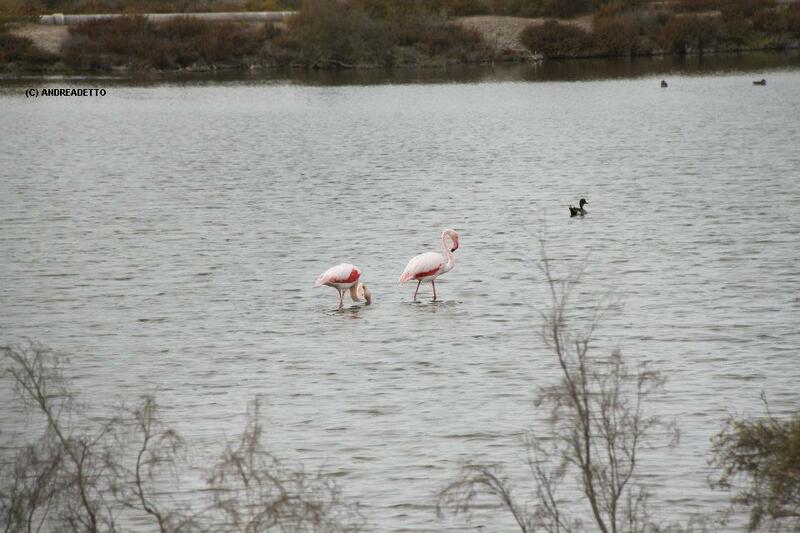 Talking about Dubai, we all immediately think about the tallest building in the world (Burj Khalifa), the biggest mall in the world (Dubai Mall), Palm Jumairah, the most luxurious hotel in the world (Burj Al Arab), but no one mention the precious Flamingo Oasis that is few kilometres away from the down town. 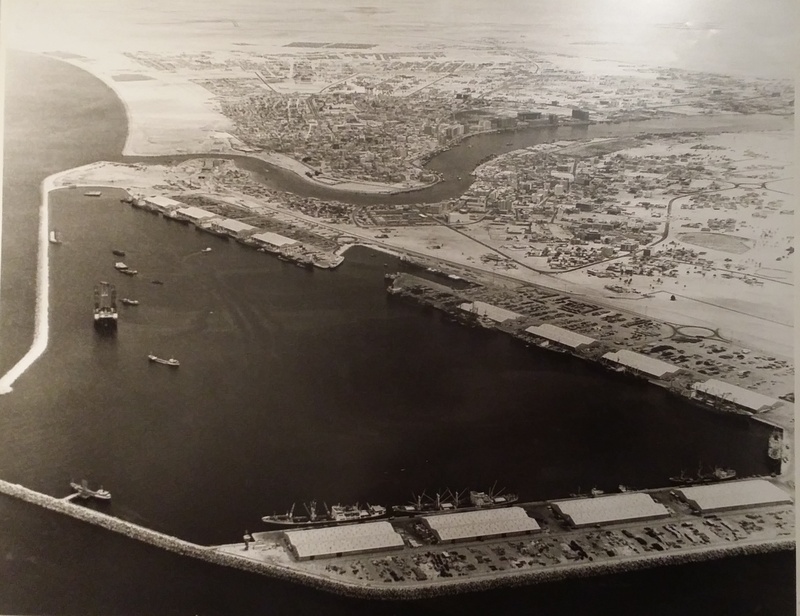 You have to know that before the Emirates discovered precious black gold, Dubai’s first source of profit was the use of the creek, a natural harbor that was used by the past generations to store and trade goods from India and Iran. In that period Dubai became the most important Gold hub for the Middle East and an important producer of pearls and other mother-of-pearls stuffs. The City, thanks to the oil revenues, expanded rapidly but the creek survived, remaining a central point for Dubai’s life. At the end of the natural creek (yes because now there are impressive projects to extend it, but this is another story) there is a neighborhood called “Ras Al Khor” that in Arabic means ‘Cape of the Creek’ where the salty water together with a colony of mangroves created a surprising Lagoon. 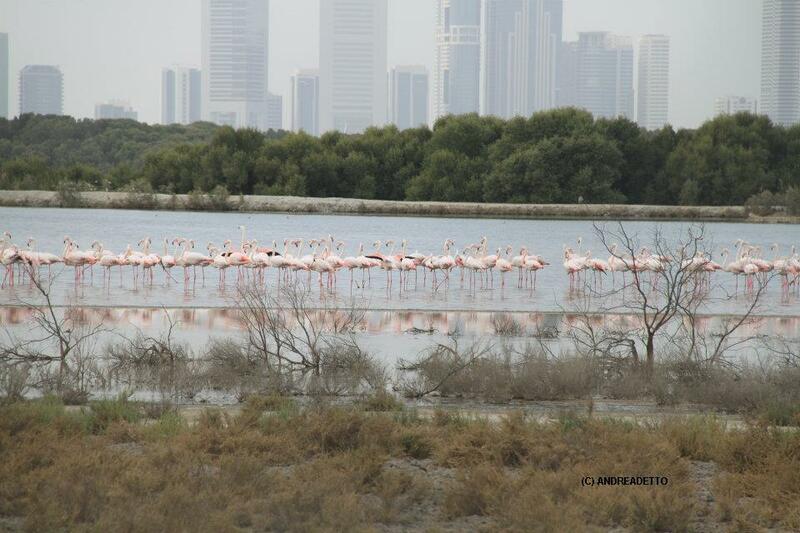 Little by little this natural spot was populated by many kinds of flora and fauna becoming the first Ramsar Site of the region with the name of “Ras Al Khor Wildlife Sanctuary”. The Ramsar Convention is an international treaty for the conservation and sustainable utilization of wetlands, recognizing their fundamental ecological functions and economic, cultural, scientific, and recreational value. It is named after the city of Ramsar in Iran, where the Convention was signed in 1971. Owing to its position, the lagoon acts as a critical staging ground for the wintering birds of the East African-West Asian Flyway and therefore it is easy to see many spectacular species of birds including the beautiful and well-known Flamingos. I remember I firstly discovered the place by chance, noticing a road signal indicating a “Ras Al Khor Wildlife Sanctuary” while I was driving to Hatta from Dubai. The Sanctuary can be visited only from appositely built observations deck, close enough to enjoy the view but distant enough to avoid disturbing the wild animals. This piece of green nature among the sand dunes is a real pearl for those who like natural spots to relax, think, take photographs and contemplate the wildlife astonishing complexity and variety. The contrast between the natural zone and the down-town built few kilometres away is impressive and leave the observer with a sense of how invasive could be the humanity and how determinant for the preservation of the wildlife it shall be. Unfortunately many huge projects are under development in the surrounding areas to create a new residential unit called “Lagoon” facing the Wildlife Sanctuary and to extend the creek to reach another part of Dubai. Let’s hope they will not ruin this little beautiful piece of nature just in name of business. It would be a shame otherwise. 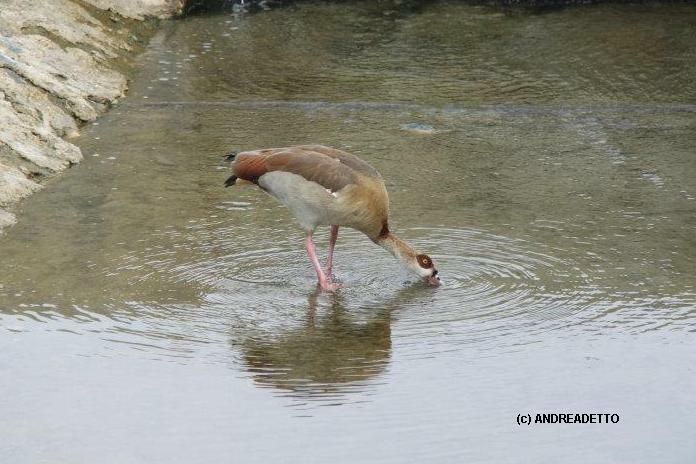 This entry was posted in Dubai, Exploring, Middle East, Travel, Wildlife and tagged Burj Khalifa, Downtown Dubai, dubai, explore, Flamingos, Nature, Oasis, Ras Al Khor, united arab emirates, Wildlife, WWF on June 7, 2015 by andreadetto.